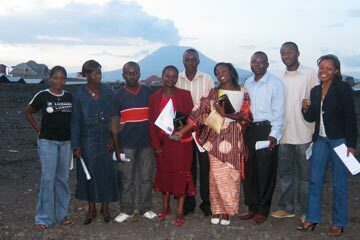 In May 2009, two of the brothers went to Goma where they met the young people who had taken part in the meeting in Nairobi in November 2008. We are sitting on two volcanoes that can awaken at any moment. One is the Nyragongo which has destroyed the town twice in thirty years. At night the molten lava of the crater projects reddish reflections into the sky; in the daytime, its trail of smoke spreads over kilometres. 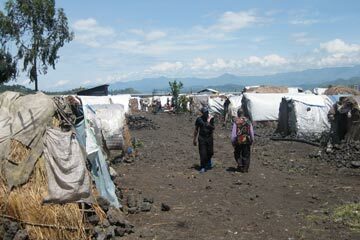 The other is the enemy rebel factions, whose extortions have been ravaging the province of North Kivu for years. In November 2008 there were two million displaced people. There are still seven camps of refugees staying around the town. 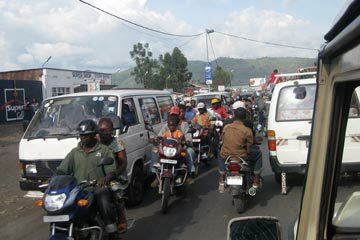 Situated at the frontier between Rwanda and Democratic Congo, on the north bank of Lake Kivu which allows one to rejoin Bukavu, capital of the province of South Kivu, in two hours by rapid canoe, Goma, which is endowed with an airport, is an epicentre of the troubles in the Great Lakes region. People here remember the cholera epidemic that decimated the columns of refugees during the mass exodus of Rwandans in 1994. “If we could join together the sociability of the Congo people with the sense of organisation of people from Rwanda, then we would go a long way and life would be easier”, explains one of our hosts. At the Makunda II camp for displaced people, 14,000 are sleeping under sheets of plastic stretched over arcs of branches. The walls are of straw. They cook with wood on a range in front of the entrance. “When one hut catches fire, twenty of those around it are destroyed” explains Blaise, co-ordinator of projects for the Jesuit Refugee service. The Salesians run a technical school in the north of the town. Three thousand pupils are training in carpentry, masonry, electrics, plumbing, sewing… Three hundred of them have come off the street or have lost their parents. A hundred children who have been demilitarised by UNO are welcomed separately. They have to follow a programme of preparation for social reintegration before obtaining the indispensable papers in order to circulate freely. These are the most difficult and the most exposed. This morning they attacked the carpenters and threw stones at the workshop windows. When they heard this, the local youths came running with bars and machetes, wanting to punish them. It took the threat of calling in the army again for calm to be restored. The ex-soldiers cannot leave the centre: they could be lynched by the locals. Unwelcome when they return to their village, stripped of the prestige of carrying arms and no longer on a payroll, some return to the centre to ask for professional training – but they can easily be retaken by the rebel bands.